If you watch in church on Sunday, I’ll show you my new shoes. 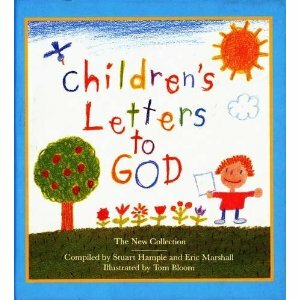 The above quotation is from a delightful little book called Children’s Letters to God. They’re alleged to be genuine, though I can’t vouch for that. Written by real children or not, I find some of them incredibly touching and thought-provoking. The above is one of them. I love the fact that this little boy had utter confidence that God would want to see his new shoes. I love that, unlike so many of our conversations with God, he’s not asking for anything, just sharing something he enjoys. I love that Mickey knows God is interested in everything about his life. But how sad that Mickey thinks God is at a distance, confined to church on Sundays. I don’t know whether this was a spontaneous letter, written out of the overflow of Mickey’s heart, or an exercise set by his teacher for which he had to think something up, but I do know that Mickey thought, with at least part of his brain, that God wasn’t right there with him in that moment. I don’t want to get too caught up by psychoanalysing Mickey’s relationship with God. It’s a brief moment in time, and might be indicative of nothing at all, but I keep it in a notebook by my bed and look at it often in my quiet times. I use it to remind me that God does care about things as trivial as my new shoes, because he cares about me and the things that matter to me.